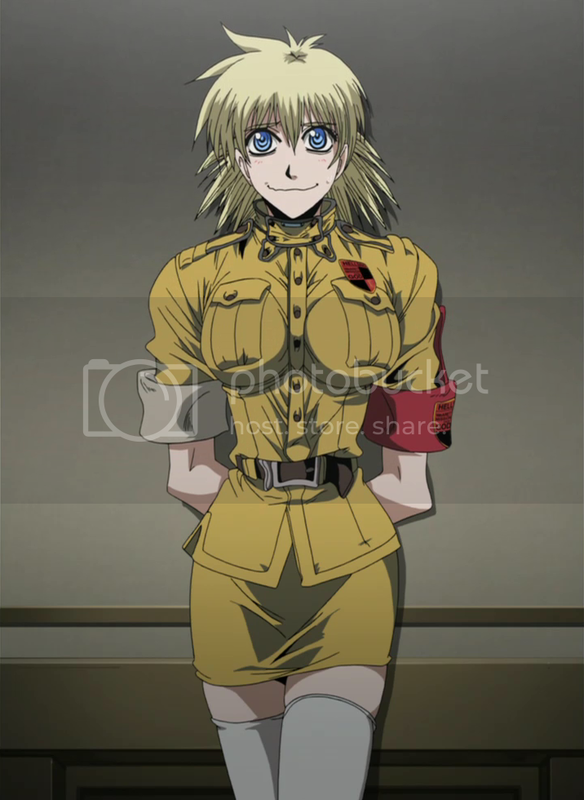 Seras was born in an average middle-class British family, her father was an undercover agent. Her father 'got in too deep' in a mission, and the group that he was investigating tracked him down to his home and murdered him. Her mother hid the Young Seras in the closet and faced the attackers on her own. She was murdered as well and the attackers started to violate her corpse. Seras became distraught and stabbed one of the attackers in the eye with a fork before getting shot and losing consciousness. She was put into an Orphanage, still dealing with the very ugly deaths of her parents, Seras had developed a noted temper. She followed her fathers footsteps in being a police officer. In a mission in Cheddar Village, where a vampire priest had turned every single one of the villagers into ghouls (zombies). The Ghouls wiped her team out and she was then abducted by the priest. Luckily the Hellsing Organization was already on the scene with Alucard, a powerful vampire turned into a weapon to kill other supernatural creatures. The priest used her for a human shield. Seeing no other choice, Alucard gave Seras an ultimatum, die as a human being, or be turned to a vampire and live. Seras chose to live. After getting shot through the lung and killing the vampire priest, Alucard turned her into a vampire. Being a vampire of the Dracul line, (She could be called a 'Draculina'.) Seras has typical vampire powers such as superhuman strength, speed, senses, and Immortality. However she is weak to sunlight, and water. Also, there are various unique powers that come with being part of the line, including massive regeneration, and summoning familiars. However to Seras, this power is untapped at the moment. Short blond hair, blue eyes that turn red when she is in 'vampire mode'. Could almost be mistaken for a boy until she opens her mouth. Had a rather stocky, but average build when she was human, now it seems that vampirism hasn't changed anything but her cup size. (Typist is totally serious.) Typically wears a uniform like this. Seras is good-natured young woman at heart who just so happens to have all kinds of darkness surrounding her. She is often 'the heart' of the organization, due to her naivety of being a creature of the night, she still retains some of her humanity. Has a tendency to be sort of awkward in weird situations. Also tends to have beyond WTF dreams. However, there is still that temper of hers when people she loves are hurt, stemming from her parents nasty death. She tries her best to be a good person, even when she is no longer a human.